Includes: 1 potato body, 1 torso with legs, character helmet, hair piece, 1 pair of eyes, 2 ears, 2 hands, 1 nose, and 1 mouth. One of your favorite Marvel Super Heroes becomes a super tater! With all the familiar fun of Mr. 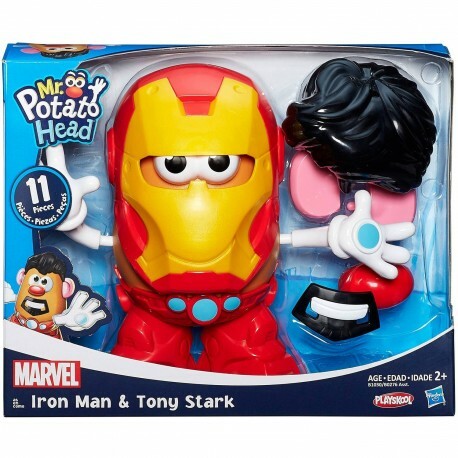 Potato Head, little hands can mix and mash their favorite Marvel Super Hero parts to create Iron Man tater and his alter ego, Tony Stark tater. It's easy to build the ultimate defender with a potato body, arms, a helmet, and legs themed around Iron Man's powers and abilities. This awesome mix 'n match set lets you create 2 Marvel character spuds. 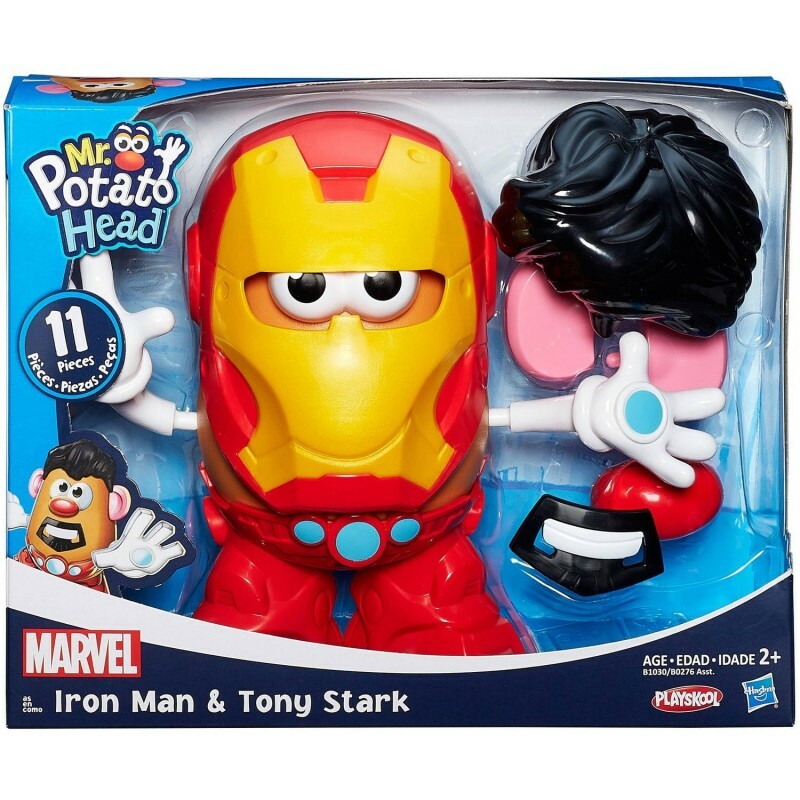 Now your little one can create Iron Man tater as well as Iron Man's other personality, Tony Stark tater, all from the same fun 11-piece set. The tater-tastic combinations are so much fun as kids play with both personalities and mix up the parts for all kinds of wacky looks! Whatever they decide to build, your child is going to love the mashed-up creations. Marvel products are produced by Hasbro under license from Marvel Characters B.V. Hasbro and all related terms are trademarks of Hasbro. Just like classic Mr. Potato Head toys, this mix 'n match set lets kids be in charge of their own playtime. Little ones can create an iconic Marvel Super Hero, and his undercover personality, or mix up the parts to make funny combinations. Tons of scenarios are possible as little ones have Iron Man tater dice evil-doers and mash crime. And with parts that work with other classic Mr. and Mrs. Potato Head sets (each sold separately), playtime will never be the same. Iron Man and Tony Stark taters are just the start to a spud-tastic world of fun. Feeling rooted? There are plenty of ways to mix it up. This Marvel Super Hero tater comes with parts that work with other sets (each sold separately), so your little one can also build Spider-Man and Peter Parker taters. The parts also work with other classic Mr. and Mrs. Potato Head sets. Snag all the sets so your tot can create a whole unique collection of their own wacky Mr. Potato Head creations. The information provided here is intended to be as complete and accurate as possible; however, product names, colors and/or materials are subject to change without notice. Many of our products, including the designs and features contained therein, are protected by trademarks, patents and/or copyrights. Appropriate legal action will be taken against any infringers of these rights.